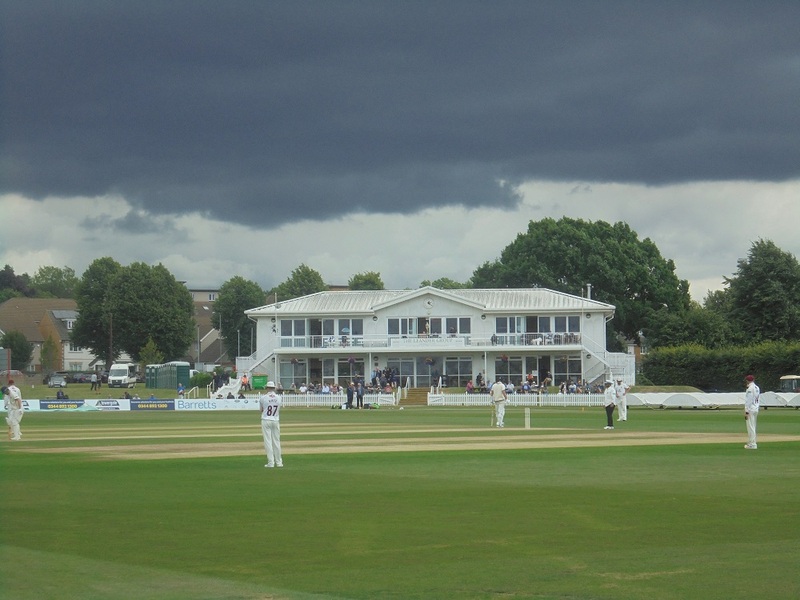 Kent wrapped up victory against a feeble Glamorgan side in just over an hour on the third day. Promotion to Division One is now assured. Next week’s final game in Birmingham against Warwickshire will be the title decider. The scoreboard at the close of play. For those who know about such arcane detail, Kent’s score of 436 gained them 8 batting bonus points. They had managed only 11 in the previous twelve matches! A worthwhile trip so far. The team is winning, met old friends. It has been very windy as assorted storms pass overhead but we have had only a very few minutes of rain to affect the cricket match. These recently constructed apartments offer a good view of the cricket. I was told that those on the top floor sell for around £500,000! Something I didn’t know about Canterbury! Despite having been to the city many times, I have never seen this memorial. Hidden away in the back streets, it’s only because I am staying in a different place to the usual that I spotted it. The second picture below explains it. The inscription does not say that they were Protestants, convicted of heresy. They came from all across the county of Kent, brought to Canterbury the county town. There were other burnings in the county, and throughout England, during the same period. The memorial, which was erected in 1899, stands in Martyr’s Field, which at the time of the events was outside the city. I am back in England for two weeks, to watch the final matches of the County cricket season with my team, Kent, needing to win one game to guarantee promotion to the First Division. First game is in Canterbury where yesterday it was quite warm, 22ºC, but very windy owing the to the remnants of a tropical storm passing by. Next week will be in Birmingha, where I have never been for a cricket match and where I have not been at all for about 20 years. Should be interesting on both counts as the match is against the top team in the Division (Warwickshire) and could be a championship decider, depending on the results of this week’s matches. Top level cricket at grounds like these is fading out as clubs concentrate their matches in larger stadia. The garden party atmosphere of these events will sadly soon be lost. Last day today and about eight barrels of beer to be consumed at the CAMRA beer tent. Scenes from the final two days. For the record Kent won the match late in the fourth day thanks to some inspired bowling by team captain Joe Denly. Summer in England, well almost! I am staying this week with friends in Eastbourne (East Sussex, south coast of England) while travelling to and from the London suburb of Beckenham to watch Kent cricket. It didn’t actually rain though, but it was rather dark. The weather until today has been cloudy and windy, but today the sun was out, temperature reached 27ºC, which was apparently a little hotter than Albufeira where I live. It’s not expected to last long. Rain is coming for tomorrow morning, which may disrupt the tennis at Wimbledon also. I will have a few more pictures at the weekend. All top level cricket in England this week is being played under experimental conditions using a ‘high-viz’ pink and playing hours of 1400 – 2100 (in theory, anyway!) with floodlights used as required. Even using my basic camera, this picture shows the pink ball as being faintly luminous. Kent’s batsman Daniel Bell-Drummond plays a curious one-handed shot in an innnings of 84 runs of Kent’s fairly miserable total of 180. At one point early on, Kent lost three wickets for no runs scored in ten minutes. Those of you that know cricket will appreciate that being 6 for 3 after about 5 overs is not good! Reports have it that the experimental pink ball lost its colour rapidly and became softer. Some even said it was getting bigger! The ball is intended to be equally visible under natural and artificial light, thus allowing play to continue in most conditions where current rules may not allow it.